This #Big #Expose I did a Month Back and today done by @NavbharatTimes Link of Old Expose: https://www.facebook.com/SMHoaxSlayer/photos/a.147357335599672.1073741828.140690692933003/311356212533116/?type=3 IMPORTANT: Many were asking me about #Shivling found in #Oldest #Mosque named #Raasa in #Arab. I’ve been trying hard. So now here it is. This analysis is based on two methods, Facts and a unique rare ancient method “Common Sense” 🙂 1. About this fake Tweet – He is being followed by our PM, but fortunately PM didn’t Retweet this 🙂 2. 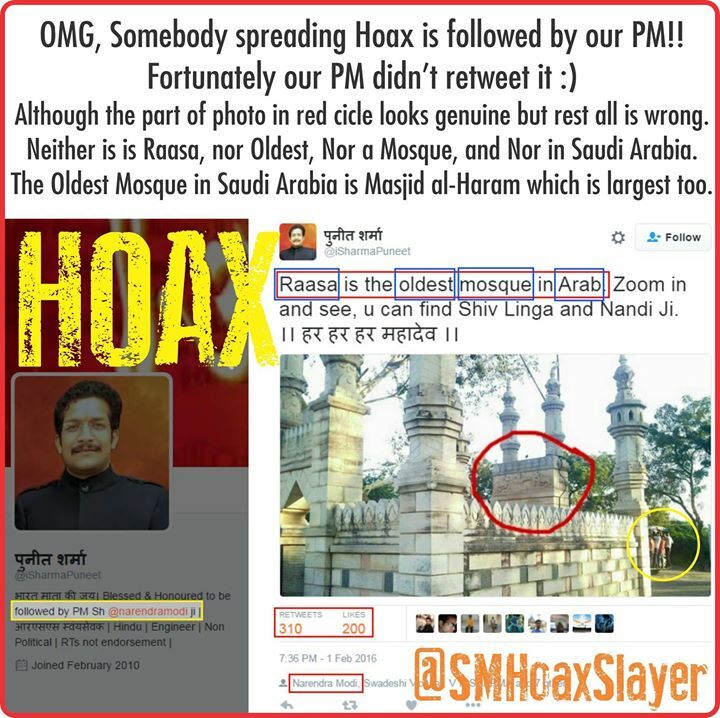 Now a Single Caption to the tweet is full of Lies – A. Raasa – There is No Mosque with such Name B. Oldest – It’s Not. Oldest in Saudi Arabia is Masjid al-Haram List of the oldest mosques in the world (https://en.wikipedia.org/wiki/List_of_the_oldest_mosques_in_the_world) Oldest in Saudi Arabia 1. Masjid al-Haram, First and oldest mosque in the world (https://en.wikipedia.org/wiki/Masjid_al-Haram) 2. Quba Mosque, built in the 7th century 3. Al-Masjid an-Nabawi, built in the 7th century; very old mosque in Saudi Arabia C. Mosque – Does it look like a Mosque in the first place ? Where is the Dome ? This rather looks like a Mazaar. But Yes, the Circled part doesn’t look photoshopped. D. Arab – Does this look like Saudi Arabia, a Country with Ferrari and Lamborghini ? Does the Jeep or Auto rickshaw on right of the image looks like them ? Do People Really have hang like Mumbai Local Train in Saudi Arabia too ? Doesn’t it look completely like a Typical Indian Scene. 3. Photo – Well most points have been described above but another point, why would anyone ignore country’s Oldest Worship Place and leave in such situation?. Shouldn’t it have huge traffic and Tourist attraction ? TWEET: https://twitter.com/iSharmaPuneet/status/694363678460633088 Apart from entire internet filled with this same Hoax (all are mrely tweets or personal blogs) the only other image on www.tripadvisor.com for an Agra tourism Package. NOTE: I’d be glad to be proved wrong if somebody gives a credible proof that this really is what the tweet says.